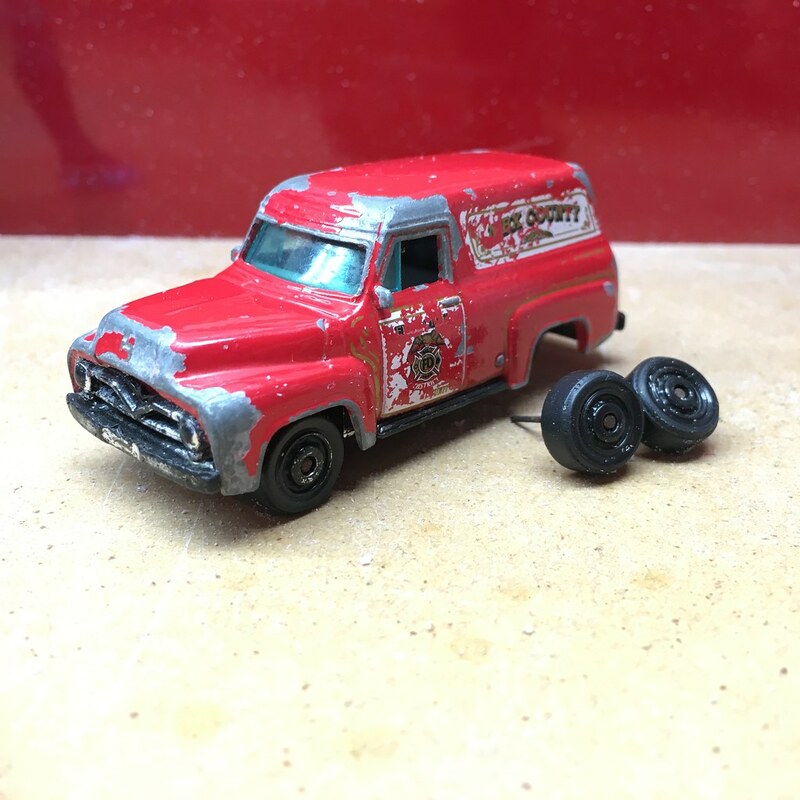 This 1955 Ford F-100 Panel Delivery by Matchbox is a car well loved at my wife’s library. After storytime on Fridays, the kids get to bring out the toys. Diecast cars are always a favorite, and she says the more unique cars get the most love. 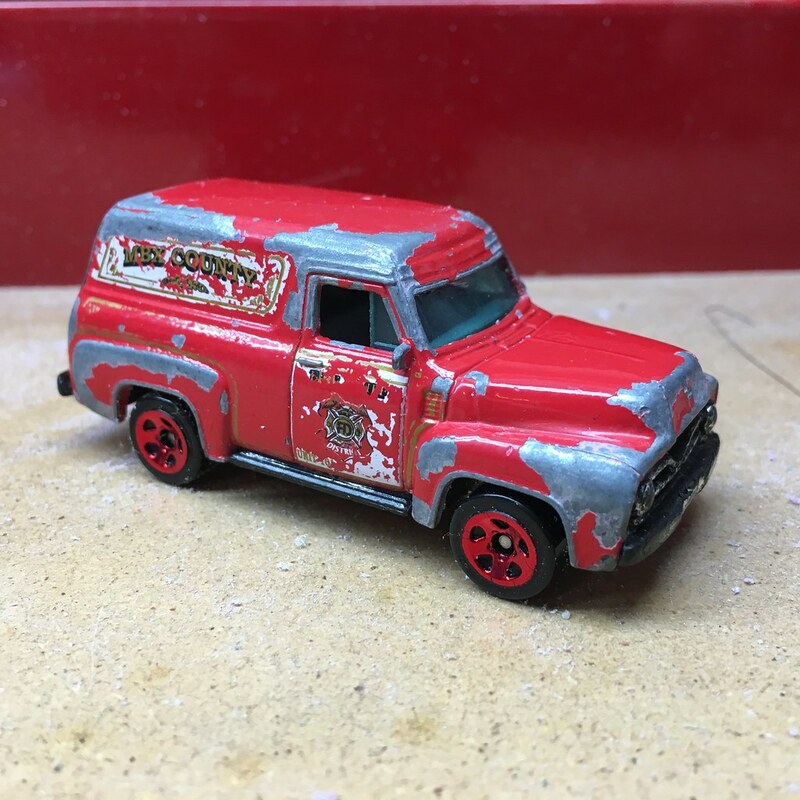 This truck showed up a few years back, went into the lost and found for a time, and then went into the box with the rest of the diecast for the kids to play with. Yesterday a kid brought it up with the back axle split in two. My wife said, “I think my husband can fix that.” I have become known as Uncle Toy Doctor after fixing my nephew’s powered toy truck. I have played around with diecast in the past, and I have a list of projects I want to do. Most of what I have done did not require work on the chassis. Well, this one was going to require something special. 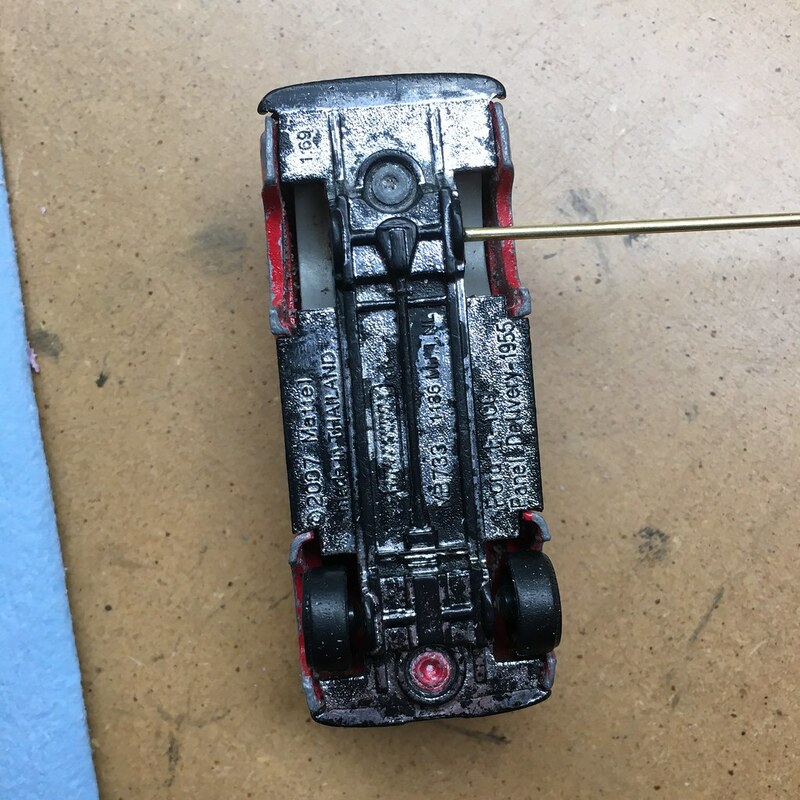 Not only had the axle broken in half, but the wheels were fused to the axle, so if I glued them in place, the wheels would not spin, and that is a no-go when this is meant to be played with. I had bought some brass tube to allow for new axles, but had not tried it yet. I had only read about it. Well, this was the perfect opportunity. I cut out the other axle, and drilled out the hole for the axle to accept the bigger size brass tube. I glued it into place, cut it to size, and I was half way home. I thought it would be fun to use a pair of wheels off of a Brush Fire Truck. Unfortunately, with about a millimeter of size difference, that was all that the wheel needed to not be able to fit. Boo! Okay, on to plan 2. Find any set of wheels that fits. All of the donor cars I had laying around, I have plans for and need the wheels in tact, or they were just too big. Then I found wheels to the Hot Wheels Back Slider. This thing has a big set of dual back wheels that were smaller than usual. And that smaller size was perfect to fit in the wheel wells of this truck. And being red, it made this truck look more like a sleeper anyway. It must be a hot rod under the patina. All glued into place, and ready to go back into service. 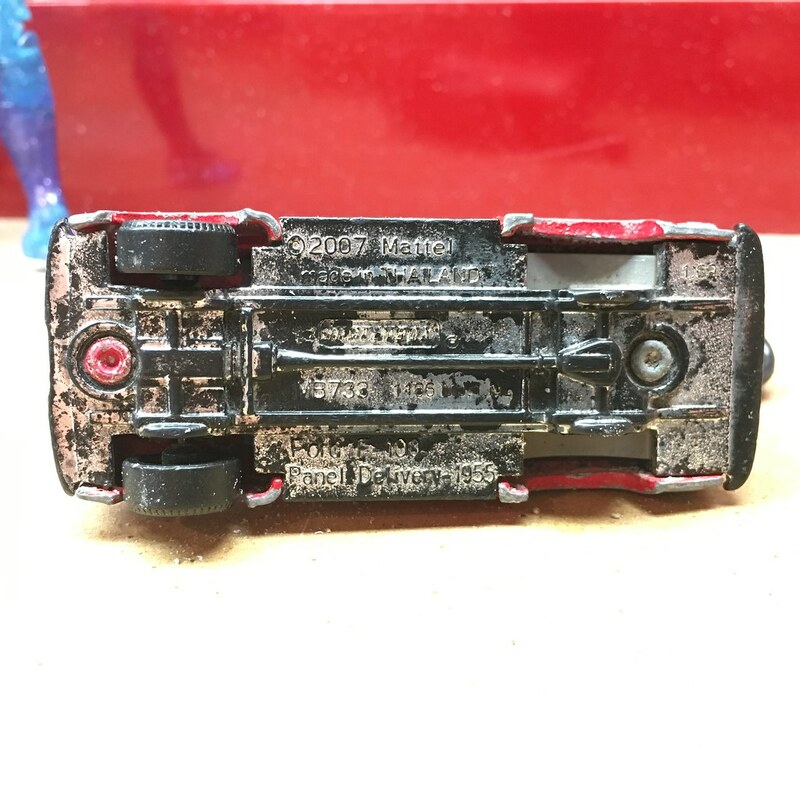 I would love to have added it to my collection, with the perfect patina to the paint, but it is important for the kids to have the wide variety of cars to play with. Really, this project wet my appetite to really get going on one of my own projects and see what I can come up with soon.